Two hours of the preparation time is spent as time that the rolls will spend in the refrigerator to reset the cream cheese and will make them easier to slice. 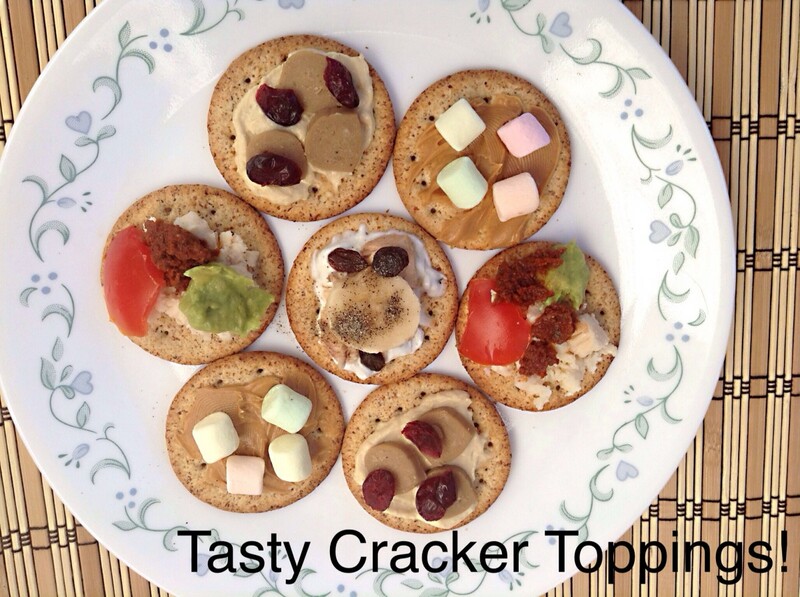 This appetizer tastes amazing, looks fantastic, and is surprisingly easy to make. 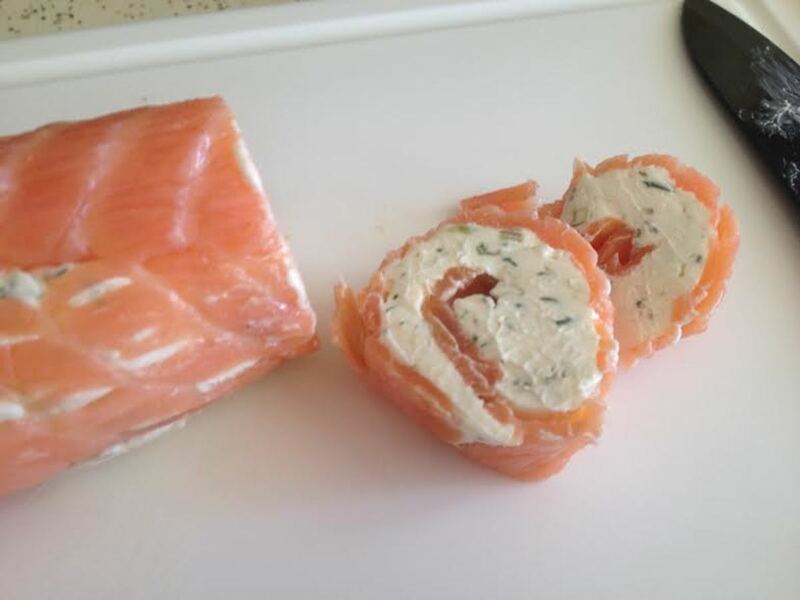 In about 20 minutes, you can have two salmon rolls in your refrigerator, and about an hour or two later, you can have one of the easiest appetizers you have ever made. It looks complicated when it is completed, but looks can be deceiving. 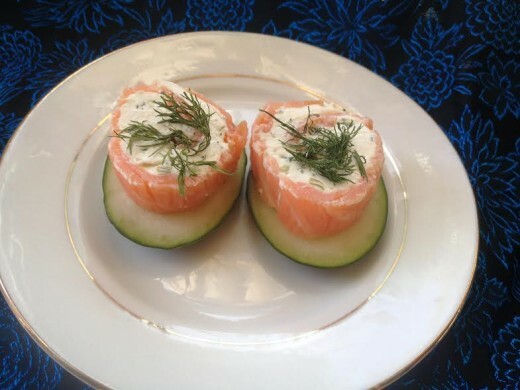 If you only have one package of smoked salmon or only want to make enough appetizers for two, you can easily make half of this recipe and the result will be perfect. 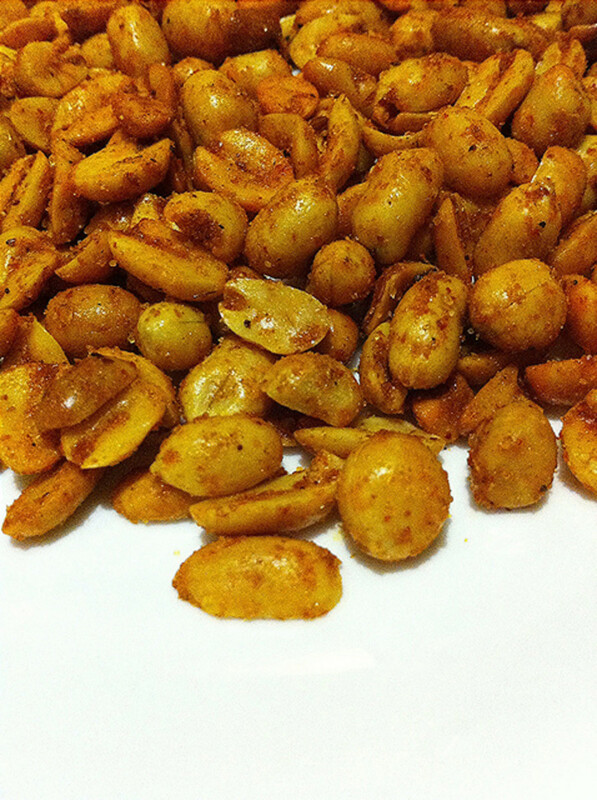 You can adjust the seasonings to your taste and the taste of your guests. That is one of the great things about cooking at home! 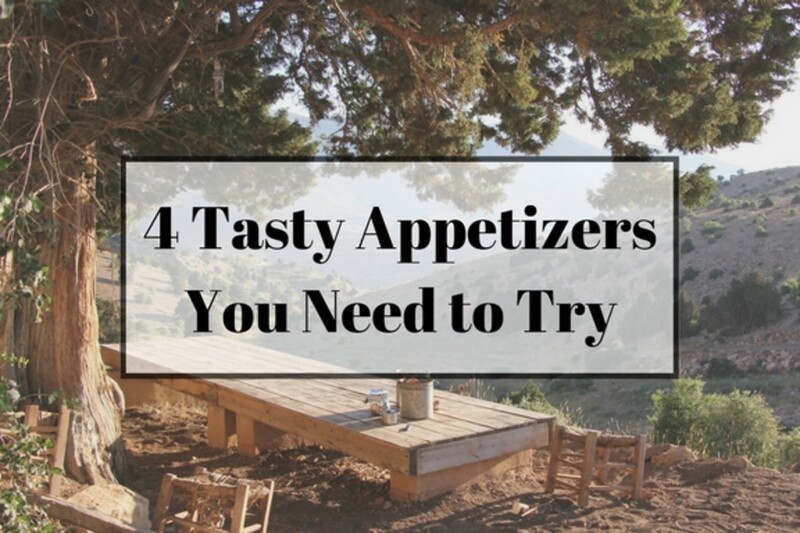 A recipe can almost always be adjusted to suit you and the flavors that you love. 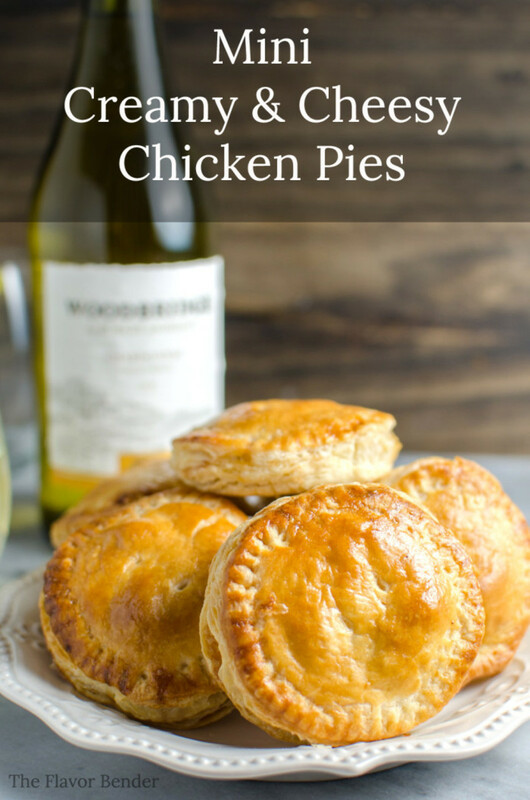 The final beauty of this recipe is the presentation. I serve these on a Himalayan salt block for a couple of reasons. 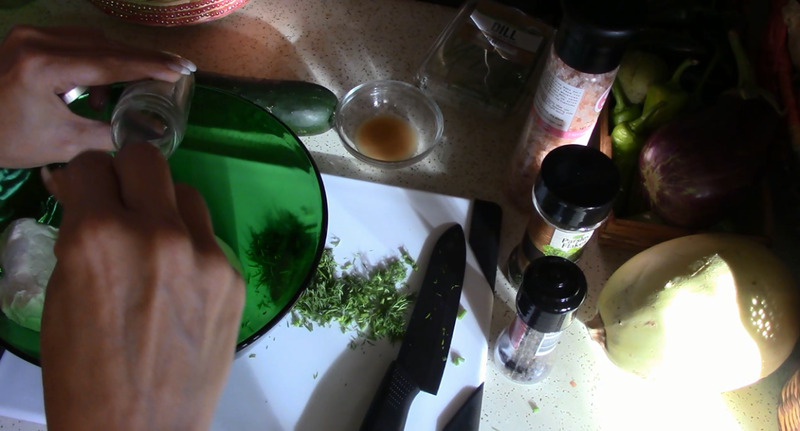 First, the moisture of the cucumber laying on the block will give a burst of mild salt seasoning directly to the tongue when the appetizer is eaten. The second reason is because of how beautiful the salt block is, and finally, the salt block is chilled before plating so it helps keep the appetizer cold when it is out for your guests. While the salt block is not a necessity for this recipe, it is a great addition for this and many other cold appetizer presentations. 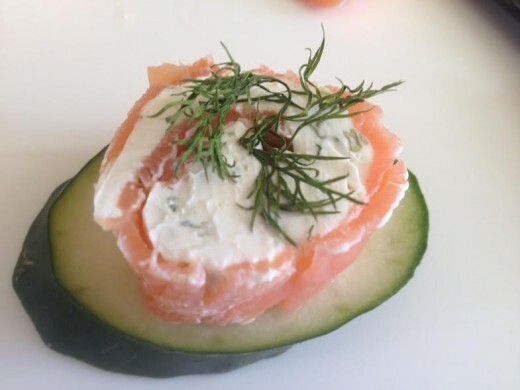 If you are using a salt block for presentation for this recipe, be sure to have it in the refrigerator to chill at least a few hours before you plan to serve the smoked salmon appetizers. 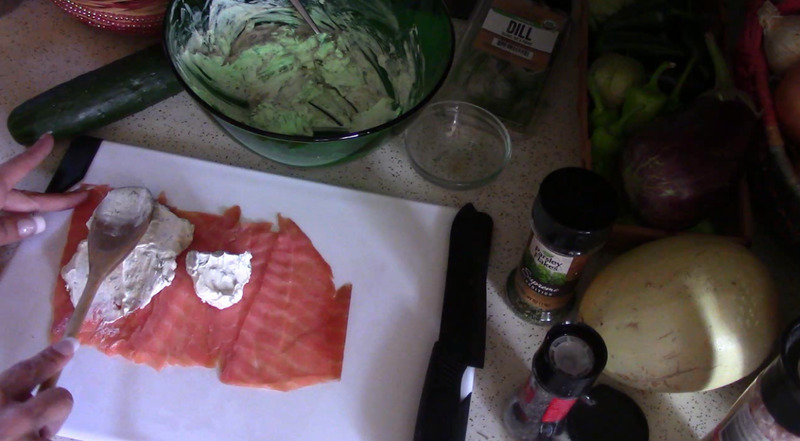 Place the room tempeture cream cheese into a mixing bowl and add the cream and capers. 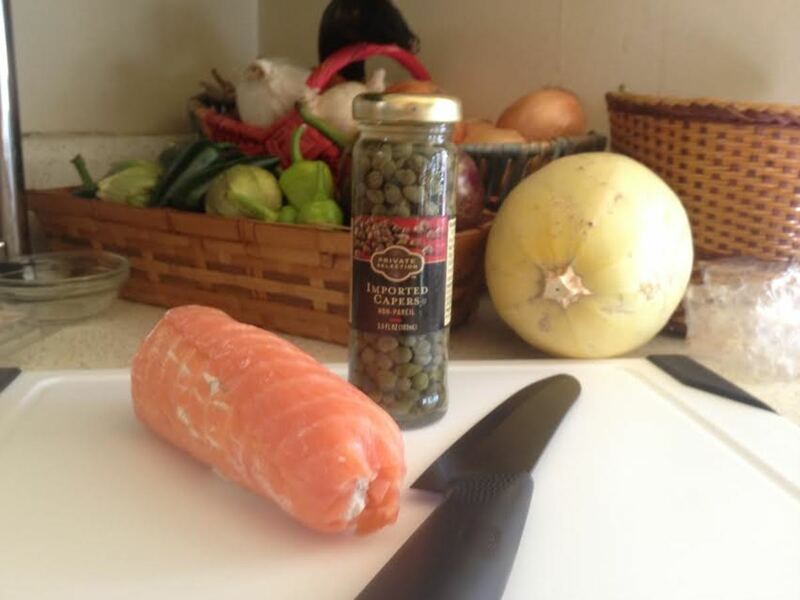 Drizzle in a splash of the caper brine. Mix the first three ingredients throughly. 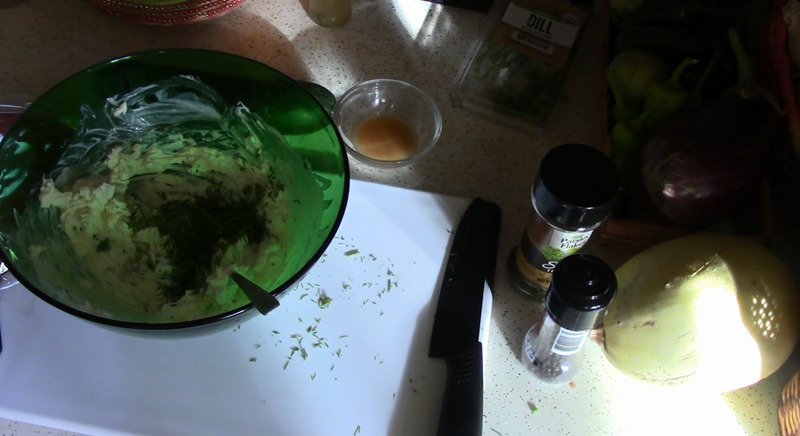 Add the dill, salt (be careful with the salt if you are using a salt block) pepper, parsley and lemon juice. Mix until well combined. 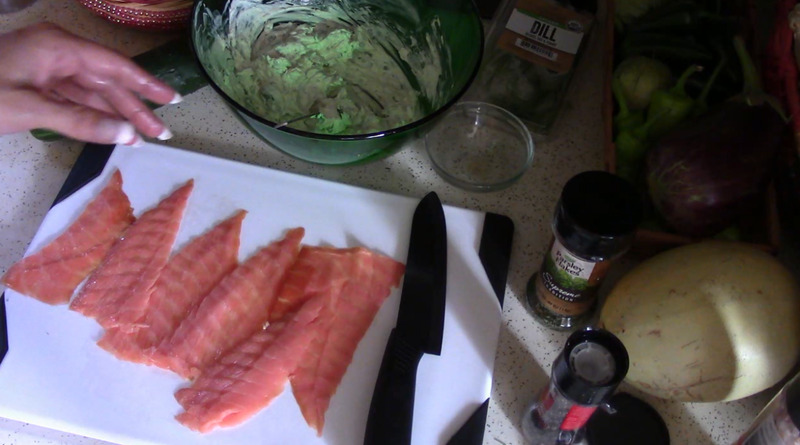 Prepare your smoked salmon pieces. 3.5 ounces per roll. Arrange them in a solid sheet. 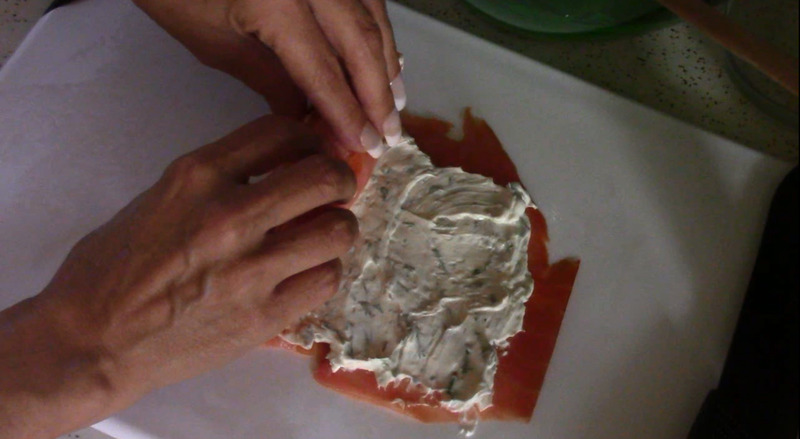 Apply the cream cheese mixture to the sheet of smoked salmon. Keep the mixture 1/4" from the edge to prevent the filling from coming out during rolling. 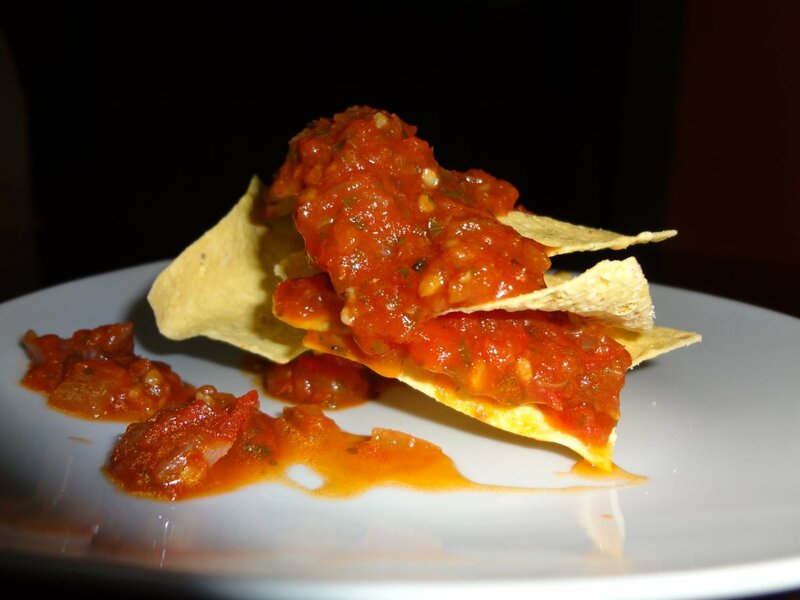 Spread the mixture in an even layer so all of the appetizers have the same thickness and amount of filling in them. 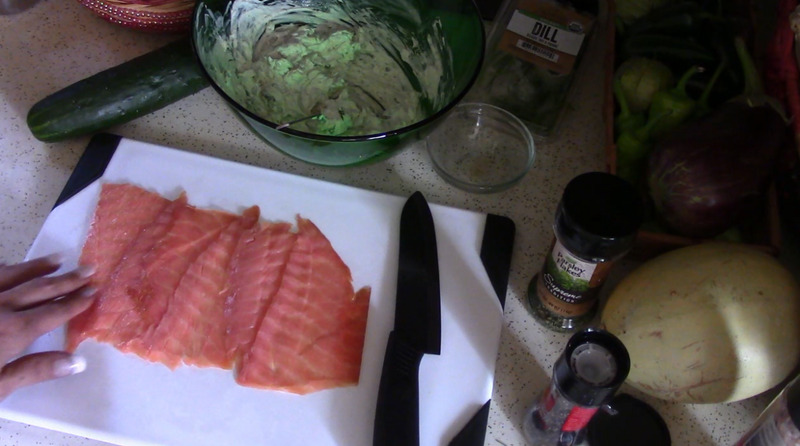 Gently coax the salmon over itself and roll it into a log. Do not apply pressure! 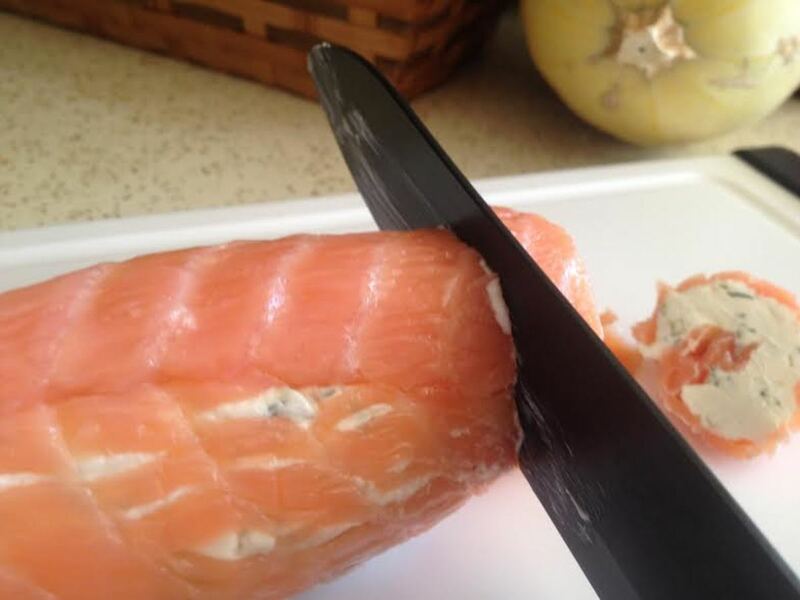 If you press down on the salmon roll, the filling will come out the ends and edges. 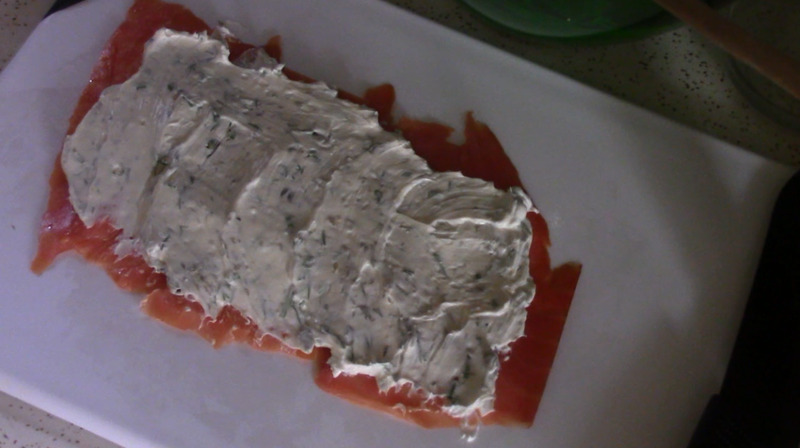 Wrap the roll in plastic wrap and chill in the refrigerator for a couple of hours (or overnight) so the cream cheese sets back up and makes it easier to slice. 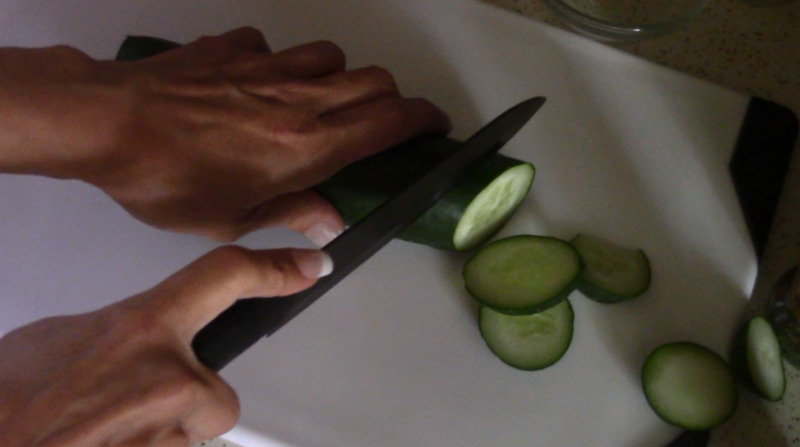 While the rolls are chilling, cut your cucumber into slices. Remove the rolls from the refrigerator and unwrap them. Using a sharp knife, cut the rolls into slices anywhere from 1/2" to 1" thich depending on how many appetizers you want to have. 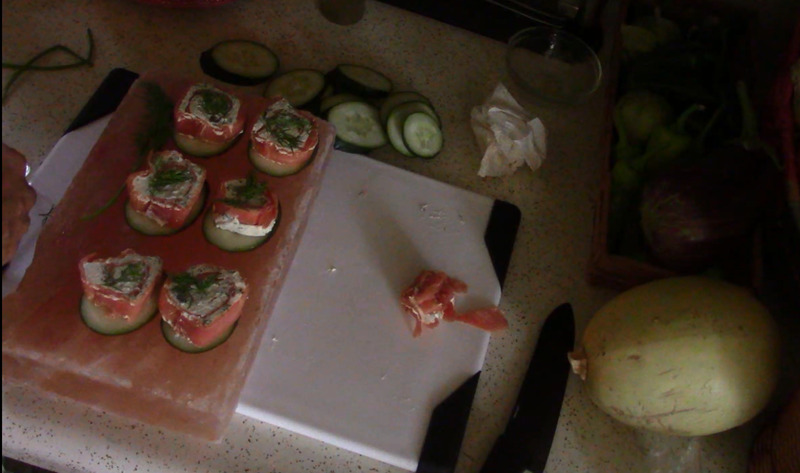 Place the cucumber slices on your salt block, platter or plate in a single layer. 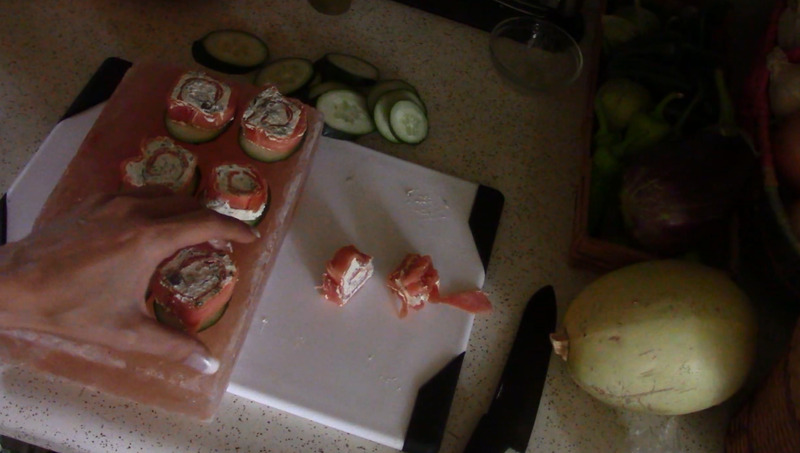 Place one piece of the smoked salmon roll onto each cucumber slice. 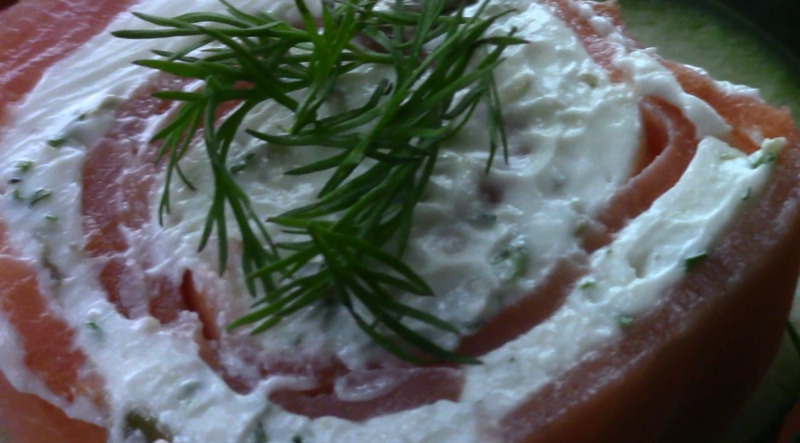 Top each piece with a few sprigs of fresh dill. 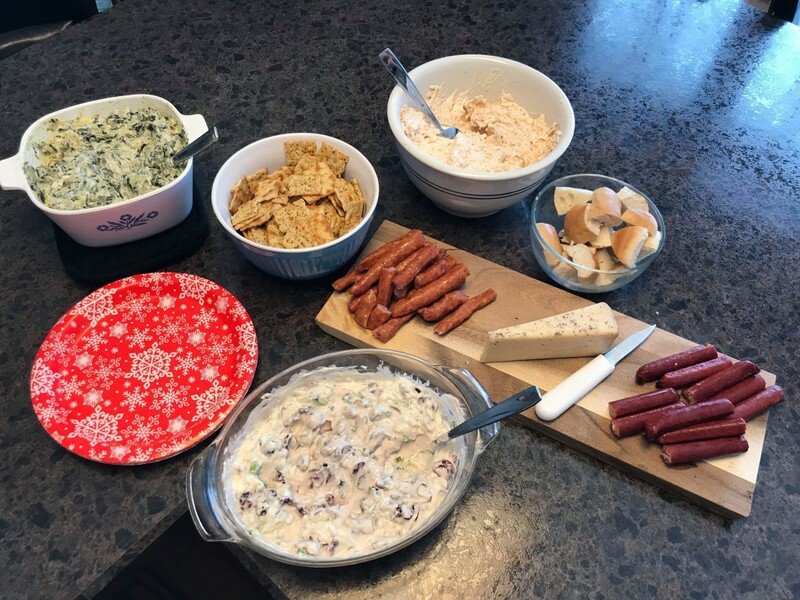 Keep the finished appetizers chilled and in the refrigerator until you are ready to serve them to your guests, or eat them yourself. The salt block is an optional serving presentation choice for this and many other recipes. They are useful in creating an interesting and different presentation as well as seasoning the food that is displayed on the salt surface. Your guests will ask you question about the salt block if you choose to use one. 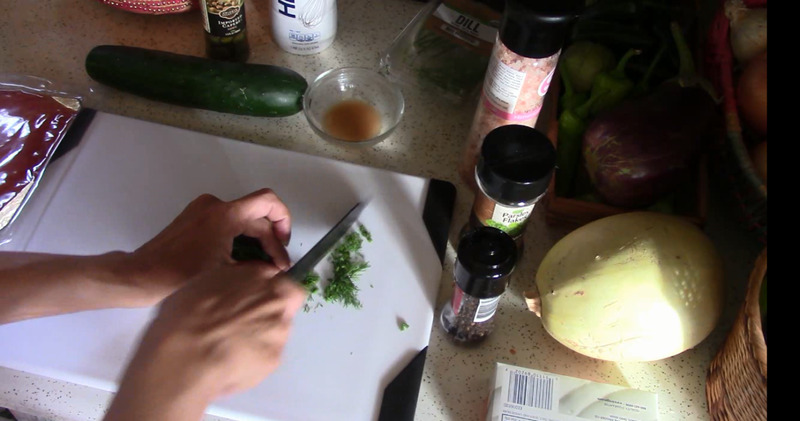 In this recipe, the water in the cucumber dissolves and absorbs some of the salt block. Not enough that it will cause any issues with the block but just enough to give the appetizer a bit more seasoning. It is important to pull back the amount of salt that you are using in your recipe if it will be served using a salt block. They are also nice because they aren't commonly used and they do create a unique presentation. 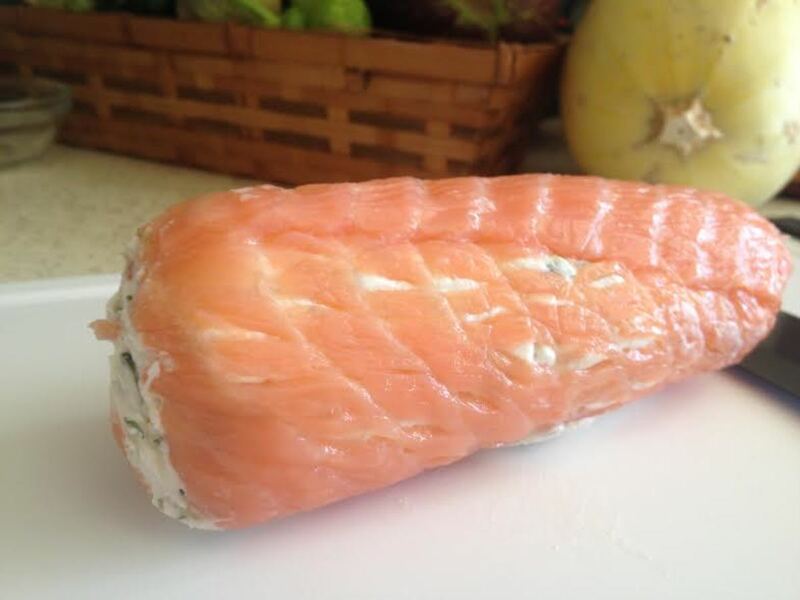 The beautiful pink and white coloring compliments many cold appetizers like sushi, shrimp cocktail and raw vegetables. They are definitely a conversation piece worth considering if you want something different and unusual in your food presentation. 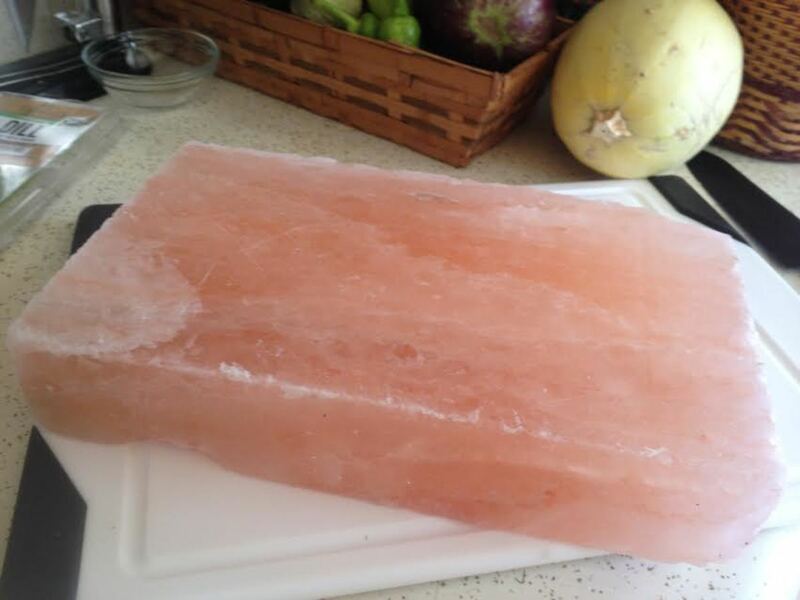 Lastly, another reason that I chose the salt block for this and many other cold appetizers that I serve is because it does help keep the food cold. The block can be chilled in the refrigerator for a few hours before serving time and it stays cold for hours after being removed from the refrigerator. Your food is sitting on a cold surface which will help keep it cool for a longer period of time. Wow, this looks yummy, now you got me all hungry! 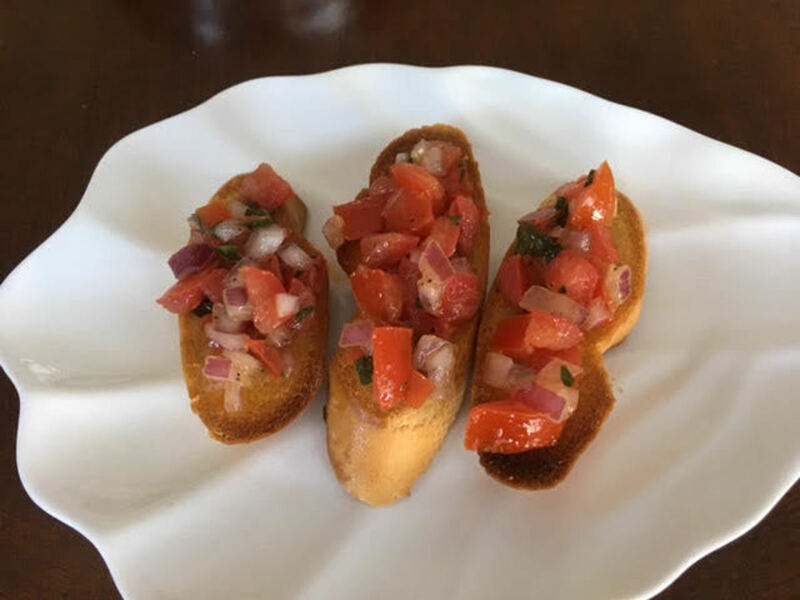 I love appetizer recipes that you can make well in advance, to free you up for other cooking right before guests arrive. These look divine, definitely bookmarking for a future party! 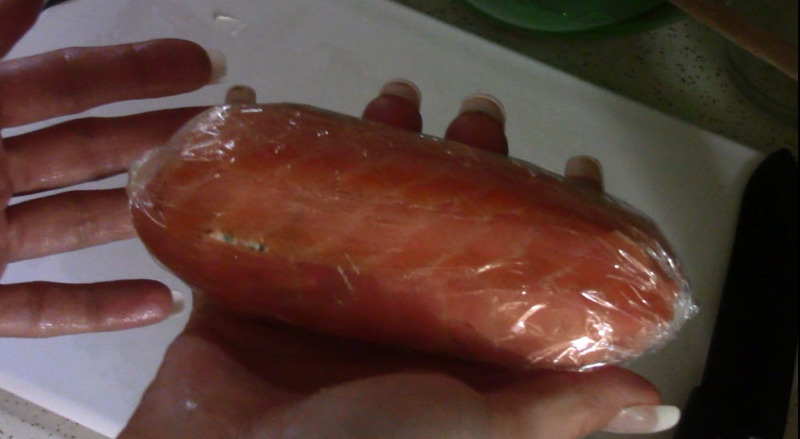 Hi Helena, I love salmon. I never had it smoked, but would like to try it. 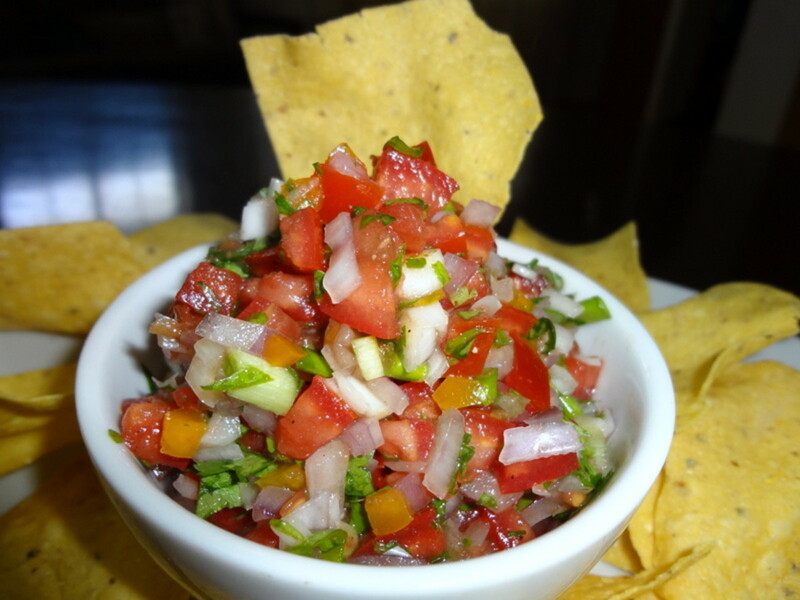 Your appetizer looks so elegant. Thanks for sharing. Thank you. 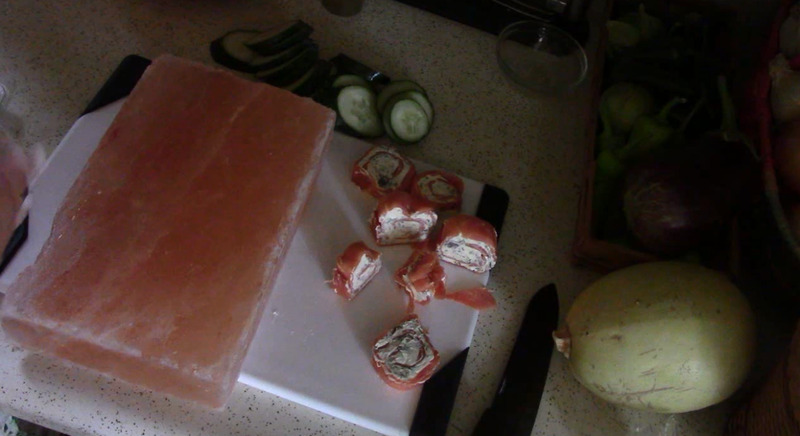 I do love using that salt block for serving cold appetizers. It's definitely something different. 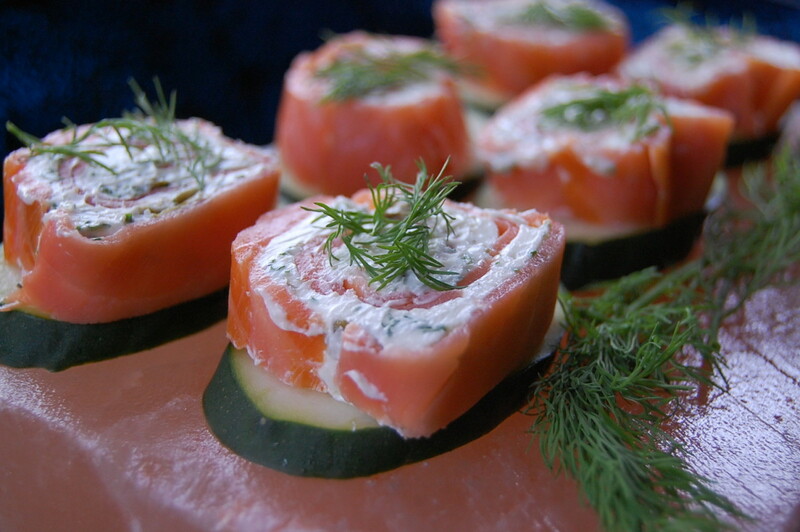 Although I'm not a fan of salmon, this would make a lovely appetizer for guests. 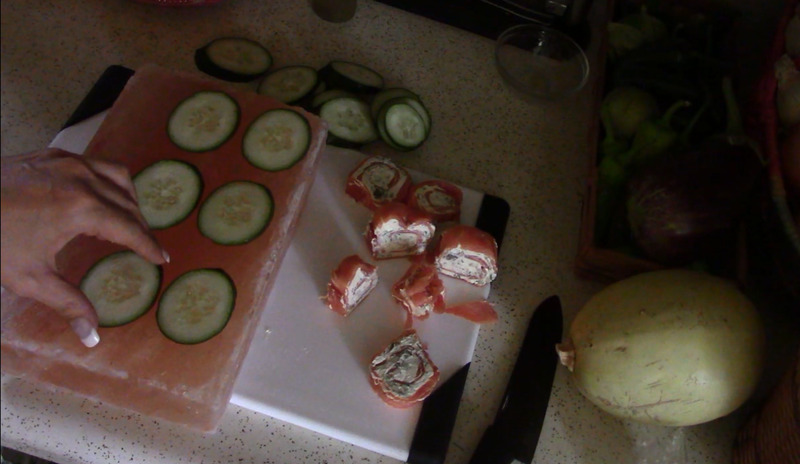 You're right about that salt block, it is the perfect way to present the salmon roll-ups.